Recently my beloved dog Sabai had been a little unwell with vomiting and he behaved as if something was lodged in his throat. A visit to the vet cured him and if your dog (or cat) have been suffering from this symptoms, hopefully it helps. Do not self medicate the animal as it may cause the condition to worsen. We tried to feed him and the cycle of feeding and vomiting (he vomits usually at night) continued to close to 2 days. He was starting to get weak and miserable looking. We then brought him to the vet, Dr V Kandasamy from Ruby Pets Clinic. This is the second time Sabai had these symptoms. Previously he had these symptoms about more than a year ago and the vet diagnosed as canine cough. how many days was he behaving like this? what did we feed him with? did he vomit immediately after food or only after a while? Because he did not vomit immediately after food, the vet suspected that it was not an acute gastro-intestinal issue. Had it be an acute case, the dog would have vomited immediately after food. Also, the vet wanted to make sure we had not left him for many days before taking him for treatment. He also observed my dog and mentioned that my dog still looks reasonably lively (if it is a serious condition, the dog would have be very weak) as Sabai was curious at the new environment and was looking around (as opposed to being very weak). The same like the previous diagnosis, the vet diagnosed Sabai with canine cough. He mentioned that in canine cough, his trachea may be inflamed. However the dog may mistaken this as something being stuck in his throat. The dog would then tried to get the object out and in doing that, ended up vomiting out the food. In the case of my dog, he did not vomit due to poisoning or digestive issues but due his canine cough when he tried to get the food out. The vet gave my dog an immediate injection consisting of antibiotics and vitamins. Right after the injection, immediately my dog was back to his jovial and cheerful self. He was no longer looking tired and lethargic. After we brought Sabai back, we fed him with some dog biscuits. Usually he does not really fancy the dog biscuits but he would eat them when he is hungry. In this case as he had not had a proper meal in him for a few days, therefore he ate the dog biscuits. Dr Kanda charged me RM70 for the treatment (less than USD20). Then in the evening, I fed him some meat liver mixed with little bit of rice and Sabai finished the whole thing up. For those who is staying in Petaling Jaya, Selangor area, I strongly recommend this vet, Dr V. Kandasamy. We’ve keep dogs and sometimes cats as pets for many years and I’ve brought a few of my pets to this clinic for treatment. Dr Kanda is really a very compassionate vet as he takes time to talk to us and explain to us. He is the first to explain to us that we have to take care of our dogs and not to allow the dogs to suffer due to preventable illness like ticks. I have wanted to take a photo of him as I mentioned I wanted to write about him but he humbly declined as he mentioned he is in this profession (40 years yeah he has been treating pets) not to commercialize himself. However, I still wish to write about him as he is such a compassionate vet and charges reasonable prices. 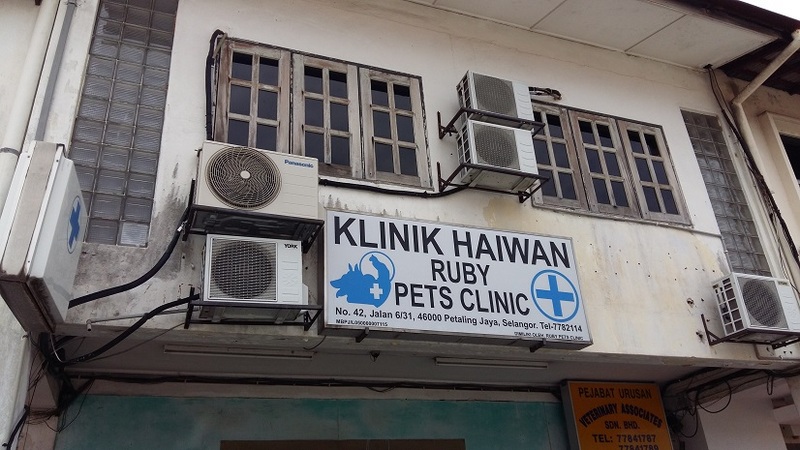 Ruby Pets Clinic in Petaling Jaya, Selangor, Malaysia. He is closed on Sunday and public holidays. When I asked Dr Kanda, he mentioned he prefers to be contacted first before you bring your pet over. This is because he generally prefers to spend some time talking to the owner for pet care. He mentioned to me if he did not schedule the appointment, then some customers may need to wait or he could not spend time to explain if there are a lot of customers. Sometimes he may not be in the clinic because of house visits or attending to other matters. Also, for owners with a larger or fierce dog, he would need to know in advance as he needs to call in an assistant to help him. Actually my first ambition was to be a businesswoman, then my parents suggested I consider to become a vet since I love animals so much. But my hopes were dashed because I failed my biological practical in STPM (pre university course) which is a pre-requisite to enter into veterinary school. I’ve resigned to the fact that I am not cut out to be a vet because of bad memory and have moved on to other professions that I am passionate about. I know what it is like to meet someone who is in a profession to help others rather than just merely in it for just making money. No doubt, Dr Kanda may not be making tonnes of money or expanding his humble little clinic to a fully fledged animal hospital with other panel doctors. But he looks happy, energetic and contented, and may I say, very youthful. You can never tell from his age that he is in the profession for 40 years. He credits it to his vegetarian diet but it is also the satisfaction of doing what he genuinely love for a living. Many pets are loved and means a lot to the owner- so if the pet is sick and the doctor is unemphatic or expressionless, it does not put the owner at ease. A vet need to be able to offer comfort to the owners, especially if the pet is dealing with an incurable illness. From my experience in bringing to a few vets, there is no guarantee that a vet can cure your pet. It is all done on best effort basis- it is the same as a human going to hospital for treatment. I’ve experience the vets (who cured a pet dog but unable to cure another. Yes, I will miss the vet with the hearty laugh whom I grew up taking my pets to. I hope your girl would get well soon and get the best treatment.